THESE photos, taken in the period between 1988 and 1991, demonstrate how football has changed in the past 30 years. Mansfield, circa 1989. A notable main stand, similar to Arsenal’s Highbury stands. Also notable is the attire of the locals. On the right is Rochdale’s Spotland, taken before the home team’s game with Scunthorpe in February 1988. Rochdale won 2-1 in front of 1,455 people. It was a cold day, the moors were misty and icy and there was some doubt about the game taking place. Interestingly, the crowd were greeted by Rochdale’s commercial manager, Alex Stepney, who was selling raffle tickets for a signed Manchester United ball. How times have changed. Blackburn Rovers’ Ewood Park, before the club got relatively rich and went on to win the Premier League. It was the 1988-89 FA Cup and they were about to play Brentford and lose 2-0. 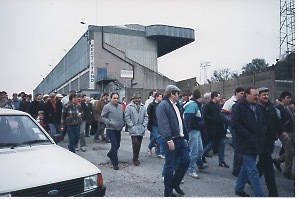 At the time, it was noticeable how few people seemed to know the way to the ground – it would not be long before Ewood was a much different stadium. Darlington’s Feethams, now long gone, taken in the early 1990s. The site, shared with the local cricket club, no longer hosts football as the ground was demolished in 2006. On this day, Darlington was hit by torrential rain, hence the photos is dark and there are ground staff on the pitch. Notts County’s Meadow Lane before it became all-seater. This was taken on Boxing Day 1988 when Notts County hosted Sheffield United, losing 4-1. In front of 11,590 people. Villa Park on April 15, 1989 at around 2pm. Everton v Norwich City, FA Cup semi-final. This was the day of Hillsborough and the crowd at Villa Park were confused by the messages coming over the electronic scoreboard that the other semi-final, taking place at the same time, was delayed due to an incident. After the game, the crowd streamed out, not fully aware of what had happened. Very interesting set of photos.